If you’re like many people, you need to save more for retirement. But that’s easier said than done, especially if you’re currently strapped for cash. Strategy: Increase your 401(k) deferral after clearing the Social Security wage ceiling. You can allocate all or part of the payroll tax savings to the additional 401(k) contributions. This is a relatively “painless” way to add to your nest egg because your take-home pay won’t be reduced. Here’s the whole story: With a 401(k) plan, you can defer part of your salary to an account established for your behalf, up to relatively generous annual limits. Such salary deferrals lower your taxable salary and cut your tax bill. The maximum amount of salary deferral in 2015 is $18,000 or $24,000 if you’re age 50 or older as of year-end. In addition, the employer can provide matching contributions up to stated limits. These pretax dollars can grow without current tax erosion until they are withdrawn. For example, if someone contributes $15,000 for 25 years and earns an annual 8% return, he or she will accumulate a staggering $1,486,614 for retirement. Distributions are then taxed at ordinary income tax rates. You can boost your deferrals after you exceed the annual Social Security wage ceiling for the year and allocate amounts that were previously spent on payroll taxes toward additional 401(k) contributions. 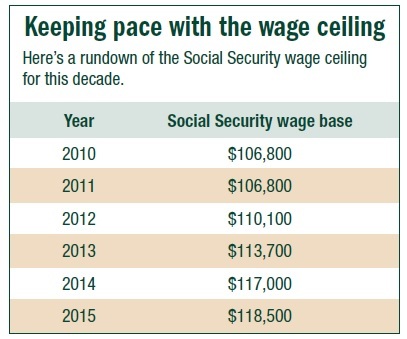 For 2015, the first $118,500 of wages is subject to Social Security tax at a 6.2% rate (see box). The 1.45% Hospital Insurance rate applies to all wages. Simplified example: Say you’re paid $15,000 a month, and you currently defer 5% of your salary, or $750 a month, to your 401(k). As things stand now, your deferral for 2015 will be $9,000 (12 x $750). However, after the August paycheck, you will have exceeded the Social Security wage ceiling. From this point on, you’ll save $930 in Social Security tax a month (6.2% of $15,000). If you allocate the $930 in monthly Social Security tax savings to your 401(k) account, your total contribution for the remaining four months of 2015 will grow by $3,720 ($930 x 4) to $12,720. After 25 years earning an annual 8% return on $3,720 of savings, you’ll have accumulated an extra $25,476—and that’s for doing this for just one year! There’s nothing to prevent you from repeating this strategy each year and adding hundreds of thousands of dollars to your 401(k) nest egg. This simplified example doesn’t take matching contributions into account. So boosting your 401(k) contributions between now and the end of the year might sweeten the pot still further if it results in additional employer matching contributions. What’s more, you won’t notice any cash flow difference because your take-home pay will remain the same. Tip: The earlier you can afford to start saving more in your 401(k), the better.